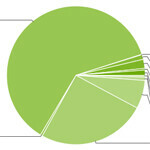 Google’s monthly pie chart O’ Android versions is out, and the winners are Ice Cream Sandwich and Gingerbread, with all other versions of Android losing ground. Ice Cream Sandwich grew to 1.6%, which is roughly a 60% increase over last month. That doesn’t sound all that impressive, but since it’s mostly Galaxy Nexus sales it’s not too bad; with 300 million Android devices activated, that’s probably more than four million units sold (depending on tablet sales). We can probably expect those ICS numbers to start to grow more rapidly in the next month or two, as new ICS devices launch and some flagship handsets get the first wave of ICS updates. In the meantime, Gingerbread is still going strong, adding an additional 3.4% to cover 62% of all Android devices. Honeycomb was down a tenth of a percent, presumably as the first wave of ICS updates start to roll out to the Motorola Xoom and ASUS Transformer tablets (both the Prime and regular variety). Froyo and Éclair were both down as well, to 25.3% and 6.6% respectively. Cupcake (Android 1.5) and Donut (Android 1.6) still reside on 1.2% of activated Android devices. Which means the two combined have fallen to less than the number of Galaxy Nexus sold in the last couple months. Yet it still seems high for versions of Android that are almost three years old. Perhaps this is just a conceit of the fast-moving smartphone industry – lots of people still use Windows XP on their desktops, and that’s a much older operating system. We know that these numbers inevitably lead to discussions on whether the data shows that fragmentation is or isn’t a problem, but at least the numbers show that users are getting upgraded to Gingerbread or higher, even if the process is inevitably slower than we would prefer. I agree. Android version 2.2 is the biggest advance for the use of Flash. Without Flash support, so many websites are unusable. 2.3 added the ability to video call but that's not as necessary as Flash imo. @Jamus You can't really make that kind of a comparison using the figures mentioned in the article. And that number will be quite a lot smaller when you deduct all the rooted phones running ICS. Not likely - while the enthusiast market is vibrant and vocal and, we think, a boon to the Android ecosystem, they make up a vanishingly small portion of the overall market. And given that less than a tenth of a percent of Honeycomb tablets were lost with the rollout of ICS to the Xooms and Transformers, the number of ICS devices is probably at least 90% Galaxy Nexus devices. Okay, I think you underestimate the Android community, but the number suggested by doubler86 is almost certainly wrong. The point is that these statistics are aimed at developers, and is based on the number of Android devices on different platforms that have visited Google Play Store. I can almost guarantee you that all the 300 million Android devices activated do not visit the Google Play Store on a monthly basis. Disagree, there isn't that much support yet for 4.0 and fully working roms. Most devices that do have a 4.0 port have no data or connectivity. So unless they are using it as a mini tab it's piratically useless.